Because German Roaches reproduce so quickly, they require a more FREQUENT & INTENSE treatment. Specialized baits and insect growth regulators are required. Plus SANITATION to eliminate harboring areas, & eliminate food sources… Baits won’t work if roaches are feeding on other food. Out of the many roach species that are found in the United States, German Cockroaches are the fastest at reproducing. They lay copious amounts of eggs at one time, and these eggs take very little time to hatch. Female German Roaches carry the egg capsule until they hatch, which means that they’re better protected than other roach eggs as well. Whats starts out as one small roach becomes a LARGE infestation in a FAST time period… An adult female lives from 20 – 30 weeks, and produces up to 8 egg capsules in a life time, all containing 30 – 48 eggs. Eggs hatches every 28 days; MUCH faster than other roach species. If You’ve seen 1… There are MANY more! German Roaches LOVE: garbage cans, sewers, drains, and dark damp places with a food sources. Bacteria is transferred from these dirty places EVERYWHERE they go. German Roaches love warmth, moisture, and food available in KITCHENS and bathrooms. Because of their small size and flat bodies, they are adept at fitting into small crevices and cracks. People in infested homes & buildings are exposed through German Roaches to a variety of bacteria and germs. PLUS… Roach “cast skins” (old dead body parts) cause ALLERGIC reactions and ASTHMA. Specialized German Roach Pest Control applications are not EFFECTIVE when German Roaches have other FOOD SOURCES, and excessive cracks / crevices to hide in. How Do You Get German Roaches? 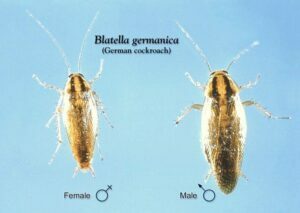 German Roaches can come into a home, restaurant, commercial kitchen, or business in diverse ways. Usually German Roaches are brought in with out our knowing. They can be in used appliances, on food or storage boxes, or under labels on cans. 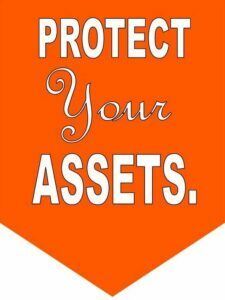 They can come in on paper grocery bags, or can get into your briefcase or suitcase at work or abroad. Roaches Harmless? ….Think Again! German Roaches Pose Health Risks in the Home, Office, and Kitchen! There are a variety of reasons why roach infestations can be problematic, other than that people tend to find them disgusting. German Cockroaches secrete substances that smell and can alter the way that food tastes. When large amounts of these roaches are present at once, there is a very distinct smell that is present. On top of this, diseases, bacteria, and viruses have all been found on cockroach bodies, which can be detrimental to human health. Food poisoning, dysentery, diarrhea, and a plethora of other illnesses have all been transmitted by German Cockroaches. Many people have been found to be allergic to German Cockroaches as well, especially to their waste and skins that they shed. Typhoid, & more than 40 other disease causing bacteria, & viruses. Studies show Cockroaches are a major cause of ASTHMA and ALLERGIES! In some cities up to 45% of kids are allergic to cockroaches. Many children develop Asthma because of exposure to cockroaches. Providing Pest Control for Roaches in Mesa, Phoenix, Glendale, Gilbert, Scottsdale, Chandler, Queen Creek, AZ & surrounding areas.